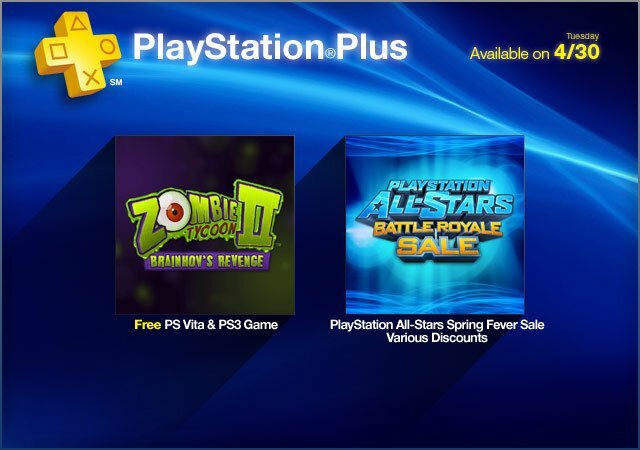 Sony is closing out April with a bang this week, giving PlayStation Plus subscribers a free copy of Zombie Tycoon II: Brainhov’s Revenge on the game’s launch day (April 30th), and offering a massive Spring Fever franchise sale on games that have characters featured in PlayStation All-Stars Battle Royale. Picking up where the original Zombie Tycoon real-time strategy title left off, Zombie Tycoon II: Brainhov’s Revenge has players take sides in the war between Orville Tycoon’s army of slow “heavy-duty zombies,” and Professor Brainhov’s mass of fast-moving agile undead. Tycoon’s quest to extinguish all life in Finkleville has him attempting a siege on the last human fortress, when his former mentor (Brainhov) suddenly returns to seek retribution for his apprentice’s betrayal. Zombie Tycoon II: Brainhov’s Revenge is free for PlayStation Plus members tomorrow, and includes Cross-Buy between the PS3 and Vita versions. The PlayStation All-Stars Battle Royale “Heritage Sale” will last for one week, so make sure to pick up any titles you are interested in before next Tuesday’s store update. Additionally, PlayStation Plus members are advised to add Demon’s Souls to their download list before it leaves the Instant Game Collection next week.